Anything beyond MLM on the schedule is, shall we say, in very long term development, and the configurations may change radically over time. Even MLM is a dicey proposition, and that is over 70% complete. If anyone here is aware of any serious work done on MLM (FGB-2) in the last 10 years, it would be good to know. So the Docking Cargo Module (in this thread) is also the MRM-1/МИМ-1? Also, what are the full Russian meanings of МИМ and УМ? And when is the European Robot Arm to be launched? The Docking and Cargo Module was renamed as MRM-1, even though it will be launched AFTER MRM-2, and even though the two modules are very different in design. AFAIK, the European Robotic Arm would be launched on MLM (FGB-2) whose launch date slips by 12 months every year. Maybe it will go up in 2011/12, maybe not. Yes. The former name of this module was "Docking Cargo Module (DCM)" ["Стыковочно-грузовой модуль (СГМ)", Stykovochno-gruzovoy modul (SGM)]. The new name of this module is "Mini Research Module 1 (MRM-1)" ["Малый исследовательский модуль-1 (МИМ-1)", Maliy issledovatelskiy modul-1 (MIM-1)]. "Mini Research Module 2 (MRM-2)" ["Малый исследовательский модуль-2 (МИМ-2)", Maliy issledovatelskiy modul-2 (MIM-2)]. The former name of this module was "Docking Compartment 2 (DC-2)" ["Стыковочный отсек-2 (СО-2)", Stykovochniy otsek-2 (SO-2)]. 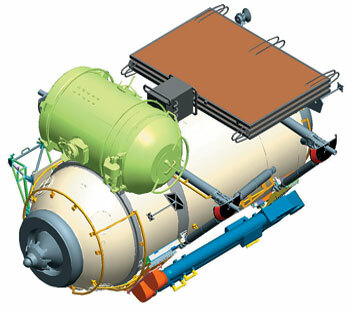 "Multipurpose Laboratory Module (MLM)" ["Многоцелевой лабораторный модуль (МЛМ)", Mnogotselevoy laboratorniy modul (MLM)]. "Node Module (NM)" ["Узловой модуль (УМ)", Uzlovoy modul (UM)]. 'Science Power Module 1 (SPM-1)" ["Научно-энергетический модуль-1 (НЭМ-1)", Nauchno-energeticheskiy modul-1 (NEM-1)]. 'Science Power Module 2 (SPM-2)" ["Научно-энергетический модуль-2 (НЭМ-2)", Nauchno-energeticheskiy modul-2 (NEM-2)]. With MLM, as planned earlier. Last month www.novosti-kosmonavtiki.ru posted Lopota´s statement, that in 2012 the Russian segment will get a new docking module, that´ll have several ports and airlocks. Is it Node Module he was referring to? Hasn't there been a drawing with ERA mounted on the DM (together with a small airlock and a radiator) to be launched with the Shuttle? Has this changed? I haven't seen that drawing, but actually when thinking about it, it would make some sense to have the ERA mounted on the MRM-1 (aka DM aka Dockin and Storage Module), as it was originally intended to be mounted on the pressurized section of the Science Power Platform which in turn is used as the basis of MRM-1. Hasn't there been a drawing with ERA mounted on the DM (together with a small airlock and a radiator) to be launched with the Shuttle? It is the spare elbow joint for ERA manipulator, not ERA manipulator. So is the ERA still scheduled to be launched on the next full Russian labratory in 2012, I believe? Thanks. I thought its the whole arm. Thanks, it's less confusing now! Per Novosti Kosmonavtiki permission this is the translation of the full recent article in their magazine on the ISS Russian segment. © Novosti Kosmonavtiki. Reference to Novosti Kosmonavtiki is obligatory when using any part of this article. ISS construction is at last entering its final stage. Recently European “Columbus” module was added to the station followed by Japanese “Kibo” module. At the end of 2009 shuttle will deliver to ISS the last elements of the American segment – Node 3 and “Cupola”. As a result of these activities, Russian ISS partners (USA, Canada, ESA and Japan) starting from 2010 will have a complete segment and would be able to start its full scale utilization, doing science and research for their respective national space agencies. Mini Research Module -2 – Docking Compartment -2, MRM-2 – DC2 (malii issledovatelskiy modul 2 – stykovochny otsek 2, МИМ2-СО2) will be used to create the fourth docking port at ISS for Soyuz and Progress ships and enable fuel transfer to ISS. Such additional docking compartment is required to increase ISS crew to 6 persons, since constant presence of 2 Soyuz ships at the station is required in this case. Also this module could be used for EVAs. Main technical specifications of the module: mass – 4000 kg, diameter – 2.6 m, length – 4.6 m, pressurized volume – 12.5 m3, cargo weight to be delivered inside the module – 1000 kg, storage volume inside the module - 2.5 m3, one workplace for the scientific equipment on an external surface of the module. Launch of the module is planned for August 2009 by Soyuz-FG rocket. It would be delivered to ISS with the help of special cargo ship Progress M – CO2 (#302, mass at launch 7290 kg) and would be docked to zenith port of “Zvezda” SM. Mini Research Module – 1- Docking and Cargo Module, MRM-1 - DCM (Maliy issledovatelskiy modul-1 – stykovochno-gruzovoi modul, МИМ1-СГМ) will be used to ensure operations of Soyuz and Progress, as well as to deliver various cargo to ISS. This module is constructed under contract with NASA, its full description is in Novosti Kosmonavtiki, issue # 6 for 2007, pages 20-21. Main technical specifications of the module: mass at start – 7900 kg, diameter – 2.4 m, length – 6.55 m, pressurized volume – 18 m3, pressurized storage volume inside the module - 5 m3, one workplace for the scientific equipment on an external surface of the module. The following cargo would be delivered at the exterior of the module: MLM airlock, MLM radiator, spare elbow joint for European Manipulator Arm (ERA) and transferable workplace with ERA mounting platform. All those elements would be transferred to MLM in the future. MRM-1 – DCM launch is planned for March 2010 at STS-132/ISS-ULF4. Module would be installed at the nadir port of FGB “Zarya”. Multipurpose Laboratory Module, MLM (mnogotselevoy laboratorniy modul (МЛМ) would be the main functional element of ISS RS which would ensure scientific utilization of RS (SM, FGB and Pirs are used primarily for ISS maintenance). MLM is created as multi-purpose scientific laboratory, which would be capable of handling rotating science payloads under Russian and foreign science programs. MLM inclusion in the RS will allow to significantly increase RS scientific capacity for fundamental and applied research projects. Module would be equipped with 12 external workplaces and several internal unified workplaces, as well as with vibration-protected workplaces, thermostatic equipment, manipulator and automated airlock. Main technical specifications of the module: mass – 20700 kg, diameter – 4.1 m, length – 13.2 m, pressurized volume – 70 m3, pressurized storage volume inside the module - up to 8 m3, power available for scientific experiments – up to 2.5 kW. It is expected that MLM will be launched in 2011 by Proton-M rocket. It will then use its own engines to fly to ISS and would be docked to the nadir docking port at SM “Zvezda”. Docking Compartment - 1 is located at this port at the moment and therefore before MLM launch DC-1 would be undocked with the help of Progress ship and then deorbited. Node module, NM (uzlovoy modul (УМ) is required to integrate in RS two science power modules and provide additional docking ports. Main technical specifications of the module: mass – 4000 kg, pressurized volume – 14 m3, docking ports available – 5. 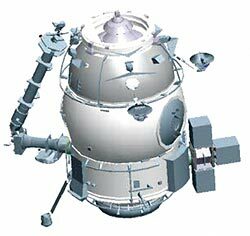 Launch of the module is planned for 2013 by Soyuz rocket. It would be delivered to ISS with the help of special cargo ship Progress M – УМ (#303) and would be docked to MLM. Science Power Module, SPM (nauchno-energeticheskiy modul (НЭМ) is required to ensure independent power supply to ISS. Main technical specifications of the module: mass – 20000 kg, diameter – 4.1 m, length – 25.3 m, dimensions with the fully deployed solar arrays and radiator - 26.5х25.3х10.5 m, pressurized volume – up to 150 m3, pressurized volume for scientific equipment - 12 m3, solar arrays power capacity – 36 kW, 12 workplaces. In accordance with agreement with NASA RS is partially supplied with power from American segment but this is possible only till 2015. For further RS operations it should have its own power system, and it is envisaged to have 2 similar modules for this purpose - SPM-1 in 2014 and SPM-2 in 2015. They would be launched by Proton-M rockets and would be docked to port and aft docking ports of the NM. Therefore, by 2015 the ISS RS will include 8 modules: FGB “Zarya”, SM “Zvezda”, MLM, MRM-1-CDM, MRM-2-DC2, NM, SPM-1 and SPM-2. RS total mass would be 122 tones, pressurized volume – up to 400 m3, power capacity – 80 kW. Such projected configuration of the ISS RS allows, if required, to start independent flight of the RS as a separate Russian orbital station. Full scale deployment of RS will allow Russian continuous presence in space, will provide an opportunity for fundamental scientific research, will give a chance for development of unique new materials, and will provide an opportunity for additional commercial services in space. In a longer term perspective ISS RS could be used for development, assembly and maintenance of the lunar and interplanetary flights. ISS RS development program is approved by the Scientific and Technical Council of RKK “Energia” and Roskosmos management. It should now get the endorsement of the Russian government and receive full financing. Only in this case the full-scale ISS RS could be completed. Author appreciates contribution of RKK “Energia” President and General Designer Vitaly Lopota and Deputy General Designer Nikolay Bryukhanov who provided information materials for this article. Thanks Dmitry for the detailed information! I was surprised to see how much habitable volume the SPM have. Thanks, Dmitriy. When I cite NK, what issue or publication date should I use? Not to be outdone, I hope NASA would keep the station past 2016... maybe use Ares V to put up a habitation module or 2, maybe a fuel depot module. Looks like the Russians will have their own happy station by that time and could simply un-dock from the American segment. One question though. Would it be virtually impossible to replace the Unity Node? She's getting older now, and if we did choose to expand the station she better be in good working order. NASA's FY 2009 budget request- Ok bend over! That's impossible. You cannot just break the entire IsS in half and put a new module in the middle. Zarya and Zvezda are old too! It is in July issue of this year (#7 (306)). I really lilke this new plan and hope it all goes ahead. I also like the fact that the Russian segment is going to have modules in all sorts of places as the US side is all one one floor. It will be more like Mir having modules above you, below you etc.